Ear infections are among the most common canine health issues, especially among certain breeds. There are many reasons for ear infections, and as many treatments; fortunately, ear infections are rarely serious and are usually treatable with easily-available medications. What Are Ear Infections in Dogs? Ear infections happen when sebum, wax, hair, moisture, and debris build up in the ear canal, providing the perfect feeding ground for yeast and bacteria. The visible part of a dog's ear (the skin flap or point) is called the pinna. The inside of the dog's ear that can be seen from the outside is called the external ear canal. This part begins with the vertical canal, then takes a turn and becomes the horizontal canal. Next is a thin piece of tissue that makes up the eardrum (tympanic membrane). The eardrum separates the external canal from the dog's middle and inner ear. Ear infections often start in the external ear canal, which includes both the vertical and horizontal canals. The lining of the canal produces sebum (oil) and wax. Dogs with ear infections tend to show specific signs. If an ear infection goes untreated, further damage can occur. Serious complications may result if an ear infection spreads beyond the external ear canal to the inner/middle ear. Hearing loss, facial nerve paralysis, vestibular dysfunction, ocular issues, and other problems may occur. A dog with an untreated ear infection may develop an aural hematoma. This occurs when a dog shakes its head so much that a vessel in the ear flap (pinna) bursts and blood fills the ear flap. The pinna will look like a pillow or water balloon, and a veterinarian will need to treat the ear (sometimes surgically). Chronic ear infections may cause the skin of the ear canal to become thickened and scarred. The canal itself becomes closed up (stenotic), making it even more difficult to treat the infections. 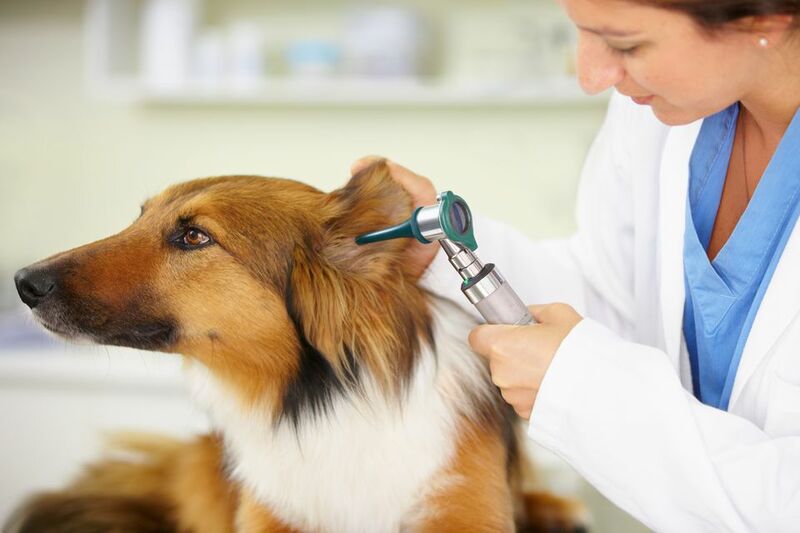 In the worst cases, veterinarians recommend surgery to remove the ear canal and close up the ear permanently, a procedure called a total ear canal ablation and bulla osteotomy (known as TECA). When excess bacteria and/or yeast grows in the ear canal, the external ear canal becomes inflamed; this is called otitis externa. Certain dog breeds, such as basset hounds and cocker spaniels. are especially susceptible to ear infections. Dogs with floppy ears may be more prone to ear infections than those with erect ears. Some dogs secrete more earwax and sebum than others. Some have too much hair inside the ears. These conditions make the ears more likely to develop infections. Dogs with allergies are more likely to develop ear infections because inflammation in the ears may occur secondary to allergies. Dogs that swim a lot may have excess moisture in their ears, leading to bacterial and/or yeast overgrowth. You should bring your dog to the veterinarian at the first sign of an ear infection. Typically, the vet or vet tech will use a swab to obtain a sample of the ear debris/discharge. The sample will be examined under a microscope to determine if there is yeast or bacteria present. This process is often called an ear cytology and it is an important diagnostic tool. The presence of yeast, bacteria, or both confirms an ear infection diagnosis. Dogs with yeast-related ear infections often have dark brown or black debris in the ears. Dogs with bacterial ear infections may have yellow-brown debris or pus in the ears. However, without microscopic evidence, one cannot be certain of the type of ear infection present. Once an ear infection has been diagnosed, your vet will discuss the proper treatment and ways to prevent recurrence. In many cases, your vet will clean your dog's ears. If there is excessive ear hair, it may be plucked (if your dog's ears are not too painful). Removal of excess debris/discharge/hair is generally an important step to begin the healing process and allow medications to work. Your vet may prescribe liquid ear medication to be placed directly into the ears. You will typically need to apply the ear medication one to three times daily. You may also be sent home with ear cleaner or ear flush solution and shown how to clean your dog's ears regularly. One or more oral medications (antibiotic, anti-fungal, anti-inflammatory) may also be prescribed by your vet. This depends on the severity of the infection and your vet's decision on the best treatment. It is very important to comply with your vet's recommendations when it comes to managing ear infections. Otherwise, serious and potentially irreversible complications may develop. Do not stop early if you think the infection is gone. If you think your dog is better, or if the treatment does not seem to be working, contact your vet for advice. Do not attempt to treat your dog's ear infection using home remedies without your vet's advice. The eardrum may be ruptured, making it dangerous to put anything into the ear. Just as it is essential that you follow through with your vet's recommended treatments, it is also very important that you bring your dog back for rechecks if recommended (or if the ears are not improving). Dogs with chronic ear infections require lifelong maintenance. There is no "cure-all" for chronic ear infections. Instead, it's about keeping the ears clean, keeping allergens to a minimum and preventing infections from getting out of control. Some dogs will need to see the vet every few months or more for diagnosis and treatment of ear infections. At home, it is up to you to prevent recurrence of ear infections. If your dog's ear infections are due to allergies, learn how you can help manage its allergies. No matter the cause of the ear infection, one of the most important things you can do to prevent recurrence is to begin an ear cleaning regimen. Ask your vet to recommend a good ear cleaner that is gentle and dries the ears. Many vets recommend an ear cleaning solution called Epi-Otic by Virbac. Most vets recommend weekly ear cleaning while the ear infection is still present. After the ear infection gets better, you should check the ears at home at least once per week. Ears should be gently cleaned whenever you see debris. For dogs prone to developing ear infections, you should get on a regular schedule to clean the ears. Clean less or more depending on your dog's needs. If your dog tends to have hair growth inside the ear canals, the hair should be plucked regularly (usually every 2 months or so depending on the rate of growth). Ask a vet tech, vet assistant, or dog groomer to show you how. Or, set up regular appointments to have a dog groomer pluck your dog's ears.